I have read through a good portion of this thread and I would like to clear up a few technical points which continue to get confused regarding rockets. First, I would like to state my current position regarding the existence of satellites and other space technologies. I do not believe that there are orbiting satellites. I have however, seen many "iridium flares," which I call floaters, with my own eyes, and having observed them to the extent I have, I find it impossible to believe this phenomenon has been occurring throughout history considering that there is no accounting of it going back even as far as the 1930's that I am aware of. Therefore, I do believe that these floaters, are man-made objects, though I doubt they are "in orbit" and I am confident that their design is not as satellites supposedly are. I hope to eventually discuss my theories regarding what kind of object they actually are, but for now I will leave it at that. I am also firmly convinced, that every application which is attributed to satellites, such as broadcast television, and gps are actually carried out through ground based technologies. In every case, the ground based option would make more sense from a business and technical point of view, and in most cases even if orbiting satellites were practically possible, the supposed applications attributed to them would not be. Let us first consider the scenario of a rocket in a vacuum discounting all other practical considerations besides the physical mechanics of propulsion and thrust. Is the proposed mechanism viable? There is no denying under Newton's three laws of motion, in this entirely theoretic scenario that it is. The mechanism is this: there is an explosion of propellent within a chamber which produces force in all directions, in theory all these forces would cancel out except those which are pointing along the opposite vector of the chamber's opening. Along this vector there would be a positive force and so the rocket would move along this vector. It is the same mechanism as the recoil that occurs when a bullet is fired out of a gun. It has nothing to do with propellent pushing against air. The medium which the propellent is exiting into is irrelevant with regards to the most fundamental mechanics. Now, if there is anyone out there who just felt a spark of hope that their science fiction fantasies may be real, unfortunately, that is where any sensibility in the design of rockets in space or the upper atmosphere comes to an end. For the second we begin to consider any practical reality beyond this fundamental mechanism of motion we will find that there are endless problems and reasons why the design of a rocket launching into space cannot work. Now, I do not know enough about liquid oxygen to suggest that it would be impossible to create such a fuel, although the very idea of such a fuel strikes me as odd, but I will give this claim the benefit of the doubt that such a fuel exists and can be made useful for it's claimed purposes. However, even if such a fuel exists, it would not be possible to store it or utilize it when moving from the external pressures of conditions on the surface of Earth to a vacuum with near zero external pressure. To understand why this is a case, consider a basic law of pressure: when there is a pressure differential between the interior and exterior of a chamber, to reduce the exterior on the pressure of the chamber has the same effect as increasing the internal pressure of the chamber. Now, if these rocket fuel tanks are already highly pressurized to begin with on the surface of the Earth, how can these fuel tanks maintain functionality through radical change of external pressure, which are not claimed to be happening gradually I might add, but rapidly. The answer is that, they cannot, and were such a design practically implemented, the fuel tanks would explode due to the rapid drop in pressure before even reaching the upper atmosphere. Furthermore, even if the tanks could somehow be designed to avoid exploding, the controlled release of their gases would become impossible, since as the external pressure decreases the force and velocity of gas exiting the tank would rapidly increase in the same way that to a tire can be deflated with control if there is a small hole, but if there is a large gash it's deflation cannot be controlled. This is especially damning to the space rocket design because the design is so dependent on near perfect control of fuel expenditure. Were someone to suggest that rockets could be made to accelerate more gradually, I would say, the more gradually they would accelerate the more possible it would be to implement a design feature in the fuel tanks which could compensate the change in pressure. If we were to add more layers of reality into this analysis then we would find many more problems and inconsistencies with the rocket narrative, but I would like to leave at this for now and to summarize. The mechanism of a rocket moving in a vacuum on the basis of purely theoretic consideration of fundamental laws of motion is viable, but when considering additional practical realities such as external changes in pressure and the functionality of a pressurized fuel tank with near zero external pressure it becomes clear that the design would not be viable. There is no denying under Newton's three laws of motion, in this entirely theoretic scenario that it is. Yes there is, and it's been proven beyond reasonable doubt by controlled experiments. Newton physics are fine but they are not applicable to this. Rocket fuel changing into gas and heat is a chemical reaction, and the molecules in that reaction cannot act upon themselves in some Newtonian way. Think about the situation visually. The molecules in the rocket fuel is starting to move more and bounce around in the rocket nozzle. Some bounce on the sides, some on the front and some drift merrily away into the vacuum. How could the fact that some drift out the back without having any way to interact with each other create a pressure difference within the rocket that makes it move? If there was enough molecules outside the rocket, the situation would be different because then some molecules would bounce back creating said pressure difference. You bring up a good point, however this point contests gas laws in a vacuum, not mechanical laws. The mechanical principles which I outlined still apply, whether the gases in question would function as theoretical suggested is another matter. Your intuition on this I believe is accurate, but it is expressed in a way which is unclear. If a controlled explosion could occur in a vacuum, then the expected motion would uphold. But, it doesn't make much sense to suggest a controlled explosion caused by a chemical reaction could be managed in a vacuum, because as you suggest there is no external pressure to ensure that two given substances mix and interact, were they somehow released from a tank into a chamber they would likely be rapidly sucked towards the low pressure opening of the chamber without ever having a chance to interact. Thus, there would be no explosion, thus there would be no motion generated. I think like Patrix, your point is correct, but you are also confounding gas laws with mechanical laws, and so your explanation fails to be as solid as you premise. When I speak of the recoil that occurs when firing a bullet out of a gun. This, if it were practically possible, would uphold as much in a vacuum as it would in a pool of water. If you have object A incapsulated within object B and object A is rapidly ejected from object B along a given vector in order for there to be conservation of momentum, object B must exert the equivalent force along the opposite vector. This is Newton's third law. The scenario you speak of would involve something more akin to the bullet simply dropping out of the chamber or perhaps being sucked by an external force out of the chamber. In other words, a leak of gas rather than an explosion of gas. In which case no work would be produced and the rocket would not move. I do believe you are correct, that in a vacuum any attempt to create an explosion would be subverted by the tendency of the gas to rapidly leak out of the opening in the chamber. It should also be noted, that the gas laws are based upon Newton's laws so one cannot favor the gas laws and reject Newton's laws of motion without ending up in a logical contradiction. When you speak of pressure, you are speaking of gas laws, and if the gas laws applied to a vacuum or in rapidly decreasing pressure are critically considered then these will readily disprove any space rocket narratives. So, I strongly encourage you and anyone else who takes up this argument to focus your attention on gas laws and the lack of means by which the supposed mechanics of rockets can be brought into practical reality. you are also confounding gas laws with mechanical laws, and so your explanation fails to be as solid as you premise. I would say that it is you who are doing this The_White_Lodge, but you are in good company. In order for Newton to apply, there has to be an action-reaction. If you fire a loaded gun in space, you will get that because the expanding gas will be able to act against the bullet in the barrel, and the reaction will be a recoil that moves the gun in the opposite direction. But if you remove the bullet (the rocket in vacuum case) there is nothing the expanding gas can act against. Hence no reaction. Well said Patrix, as far as I can tell we are in total agreement. Altair » October 31st, 2017, 9:32 am wrote: So, the idea is that work is done by pressure. In an atmosphere, the gas ejected from the rockets would build a pressure gradient, from a maximum near the exhaust, and gradually decreasing until it levels off with atmospheric pressure. So, it's the pressure buildup what pushes the rocket upwards. A nice way to model this would be to imagine a compressed air cilinder and then opening the valve. That is the key part of the argument that convinced me rocketry cannot work in a vacuum! Within an atmosphere where there is air pressure and expelled gasses encounter resistance when they are forced out of the nozzle above a certain velocity, thus creating a pressure gradient that pushes in the opposite direction against the nozzle (and, by extension, the rest of the rocket). But in a vacuum, gasses and particles can be ejected at any velocity at all, even at many kilometers per second, and no pressure gradient can form so no pressure against the nozzle can be created. You are close to having the physics correct on this, but alas, this talk of a pressure gradient creating thrust is entirely incorrect. Whether you or anyone else here actually cares to understand the physics of why a space rocket is not a practical reality is another matter, perhaps we should just move on. The pressure gradient has nothing to do with the mechanics of an explosion creating thrust or recoil. It does however play a critical role in ensuring that a "controlled explosion" can be managed in the first place, which as I and Patrix have explained is the reason why a rocket in space is an impractical reality. I know the argument about Newton's 3rd law, but this fails for the important reason that the only useful reaction force from it is for mass that is ejected at precisely the angle opposite the direction of travel. Only a very narrow stream of mass is expelled along this exact trajectory to cause rectilinear motion. The vast majority of mass will be expelled at some glancing angle that would produce a torque, causing rotational motion instead. For example, in the pic below the green line represents the only exit trajectory that will cause a recoil resulting in rectilinear motion. 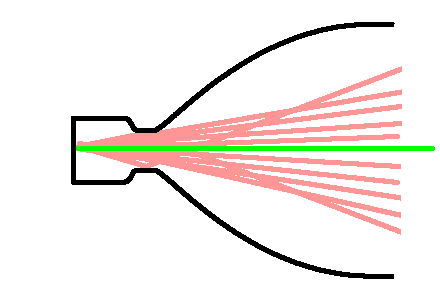 All the red lines represent but a small fraction of the many other possible trajectories at which masses can exit the nozzle and whose reaction force will be a torque. The net effect is that the 3rd law has practically no effect on rocket thrust at all. The only way to ensure all the masses eject along the green trajectory would be to have a nozzle as narrow as the width of the individual exit masses (molecules) which would obviously severely restrict the rate of flow to near zero. EDIT: This would make it analogous to the bullet in a gun example. Re: Does Rocketry Work in the Vacuum? titled "Does Rocketry work in the Vacuum". Please be more careful in the future - when choosing where to post your thoughts on this forum. In fact, no man-made tank could possibly withstand the pressure differential between a pressurized tank - and a surrounding vacuum. It has all to do with tensile strength, of the sort that we simply do not have on earth : not even a diamond tank would do. As for those still nurturing the fanciful idea of rockets being propelled in space - let me know if you'll ever witness a fish jumping out of the water and starting to fly up, up, and up in the sky. That would be quite miraculous. Yet, if you witness such a miracle, let me know! And make sure to capture a video of the miraculous ascent! You may sell it to some churches who, nowadays, are running out of miracles with which to attract new converts. Jesus walked on water, didn't he? Thank you Simon, that argument really is the clincher, and there is a set of equally as irrefutable arguments against the satellite narrative which I plan on detailing shortly. I now understand your explanation and I agree, however I must warn you that phrases like: "the 3rd law has practically no effect on rocket thrust at all" are very liable to be misinterpreted, especially in this internet environment with flat-earthers, mandela-effecters, and rational trigonomitrists. When I read that kind of phrasing, I took you position to mean Newton's 3rd law of motion was itself suspended because of a vacuum, which is absurd. I still suggest framing this particular argument with the emphasis on gas laws as you just did and with minimal emphasis on the laws of motion since they are themselves unaffected by a vacuum, while in contrast, the gas laws we know on Earth virtually break down completely in a vacuum. Looking forward to the "floaters" explanation. I always found it weird that people would "invent" some system that operates in an unpredictable place such as space instead of making a way more cost effective system on the ground here on earth, which I suspect they actually have as well. I sincerely appreciate your contributions here thus far, and I’m in agreement with you and Patrix about Newtonian Laws, and how they would (and wouldn’t) work in the vacuum. For the more simple minded people whose eyes glaze over in these posts, have no fear. I’ll break this down in such a way as to give the SpaceFanBoy clubs something to Aim for. 6. Should you meet unexpected resistance before going into orbit (or beyond? )- PAY ATTENTION! THIS IS KEY! 7. Begin to throw all billiard balls, fruit, and well. . . basically everything, as hard as possible towards earth. This will provide some much needed thrust in such ultra thin “air”. 8. Enjoy the ride as much as much as possible, because it will be your last. Mods: Feel free to launch my Post into the vacuum of the Derailing Room if deemed appropriate. I can’t help but have a little fun around here sometimes. Note: The above Instructions are loosely based on a short story I’m writing entitled “Coconuts For Isaac”. Great post. Laughed out loud I also find the "Don't you believe in Newton!?" argument utterly absurd. Although I still need to stay humble since I not long ago was firmly convinced rocketry had no problems with vacuum. To my only defense I can say that I never actually tried to understand the physics, but now that I have, I find them impossible.